It’s southwest Colorado and the springtime is advancing. Sometimes not quickly enough for warm weather visitors, and sometimes a bit too warm for residents that are wary of drought. Since none can control the weather, we should appreciate what comes. What comes, sooner or later, is the greening of the landscape with the deciduous trees and shrubs. The grasses, and the forbs with their wildflowers. And so I drove up along the upper Dolores River valley. From Cortez and the little river town of Dolores itself. Up along the broad flat floodplain ranches and smaller properties. Cottonwood trees leafing out along the river. Aspen stands breaking out tenatiously on the mountain slopes above. San Juan Mountains, Lizard Head Pass, Colorado. 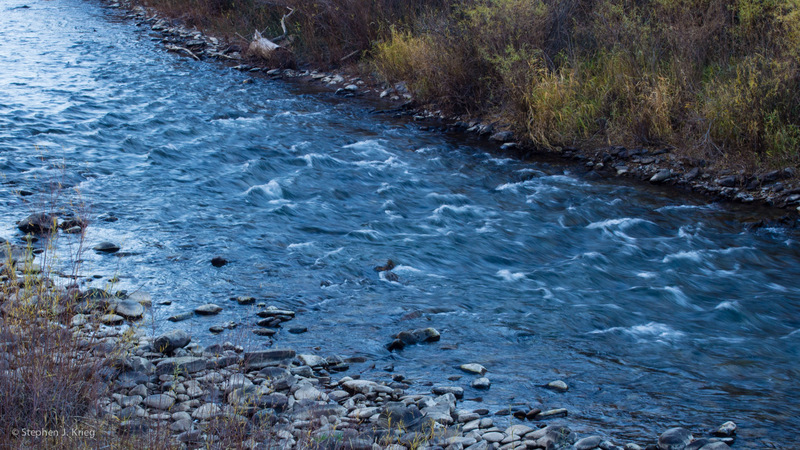 The Dolores River swollen with snow melt from the high mountains. Muddy and cold and doing its job of continuing to sculpt the high mountain landscape. I drove up to Lizard Head Pass, the divide between the Dolores and the San Miguel River watersheds. It was like going from spring to winter. But it will soon be spring up there, too. Dolores River Valley, upstream of Dolores, Colorado. 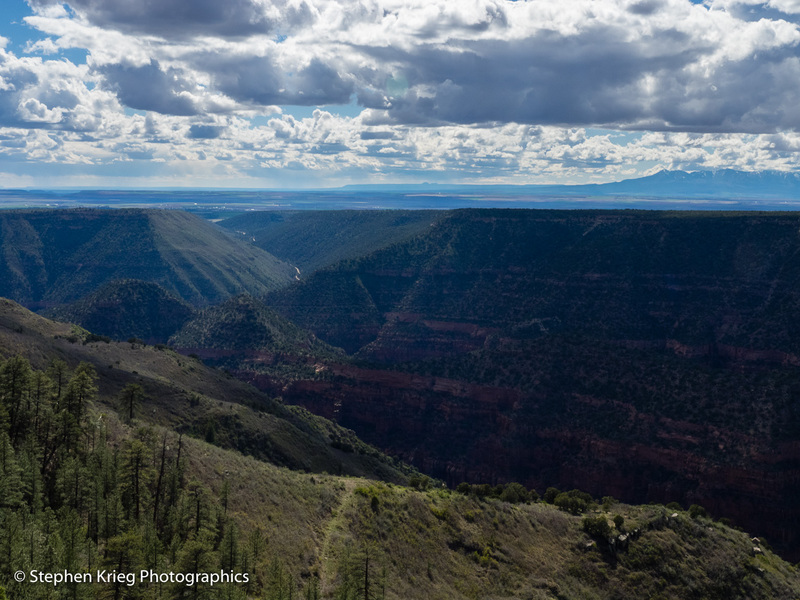 Driving up the Dolores River valley, from Cortez, Colorado. In springtime. Gorgeous greens on the river floodplain. Grasses and forbs celebrating the Spring season. Cottonwood trees leafing out above. 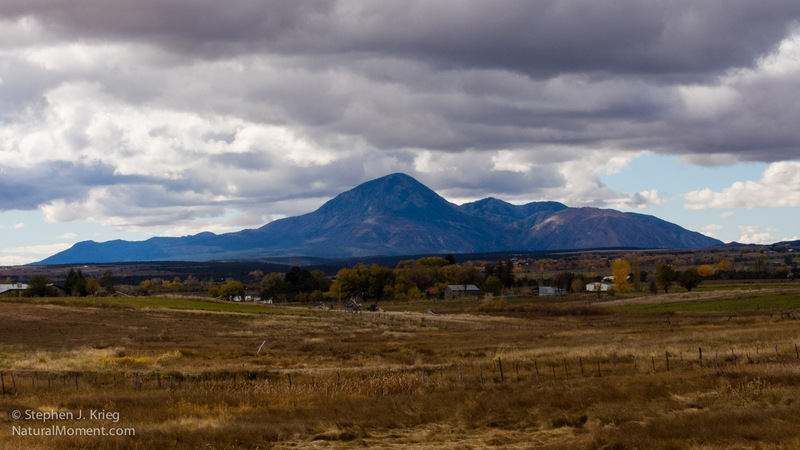 The Great Sage (now agricultural) Plain and Sleeping Ute Mountain. It was back to the San Juan National Forest in southwest Colorado. A little bit north of Dove Creek. 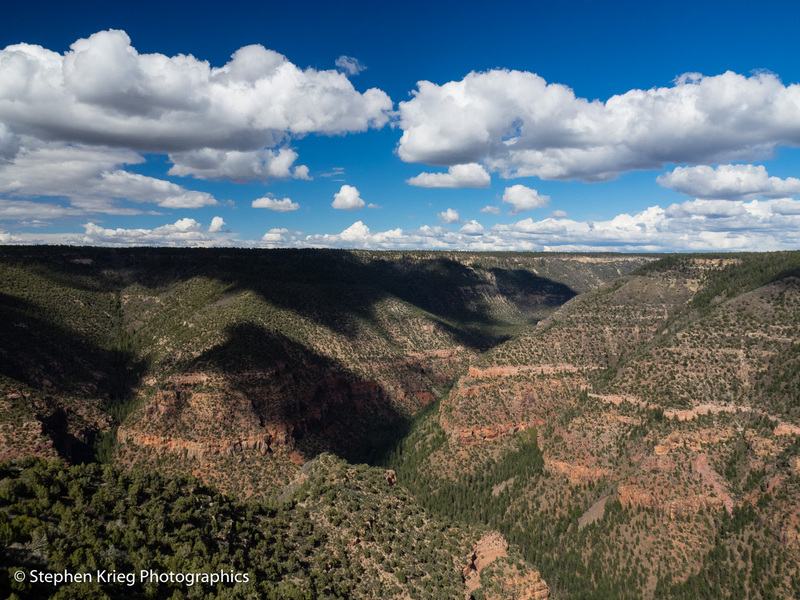 Off the north edge of the Great Sage Plain and into the Ponderosa pine forest surrounding the Dolores River Canyon. An area I was coming to know better and better. Dolores River Canyon side canyon, looking south to Dove Creek. The first stop: to the Dolores Canyon Overlook. Which is actually on Bureau of Land Management (BLM) land. They have a very nice little park there, an easy walk to the overlook down into the canyon. And there’s usually no one there. Maybe a few locals on the weekends, but it’s too far from the beaten path, in a very rural area anyway, to be crowded. My kind of place. After taking in the fine springtime afternoon at the viewpoint, it was time to decide on my camp location. Once there I settled in and gathered firewood for the evening. And also cleaned it up a little bit. Just a few things left behind by some other campers, nothing much. Following another of my principles: If you take care of a place, it will take care of you, too. It’s just sensible. 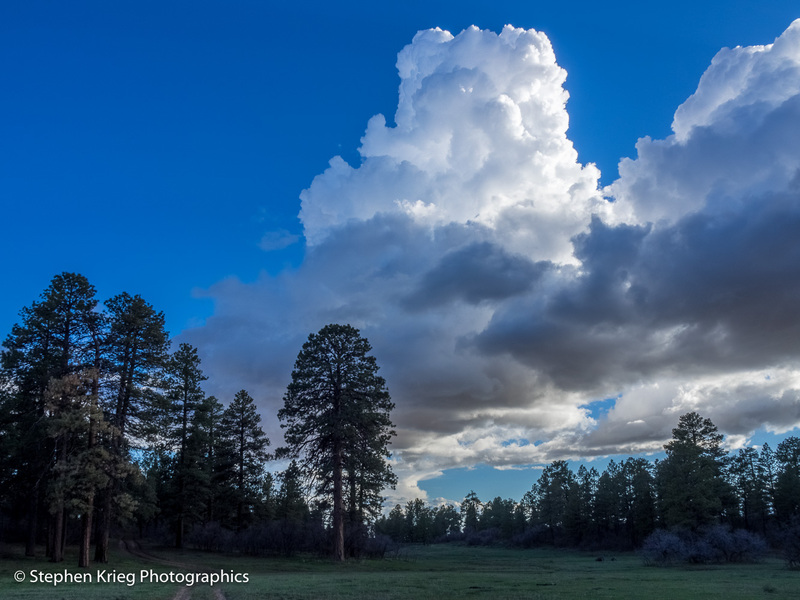 Early evening clouds towering over the Ponderosa pine forest. Time to sit back in my folding camp chair and savor. The clouds, the Ponderosa pine trees, the light, the delicious high country air. Eventually evening light came on. Right on schedule. Though I had no schedule. Tough lighting for photographs, high contrast between the brilliant clouds and shadowed forest below. Dramatic lighting. Brilliant whites to blues, then sunset colors in the clouds. 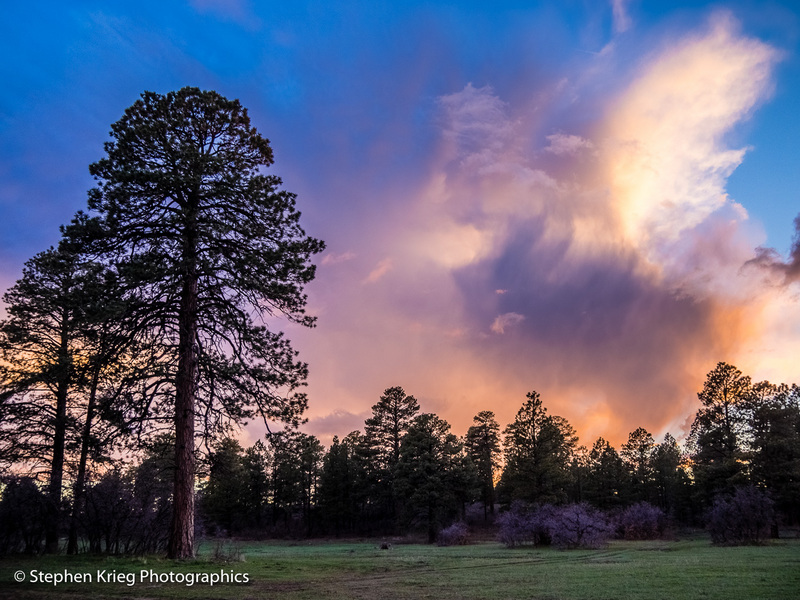 Sunset colors in the clouds, framed by Ponderosa pines. Then dusk, finally. The fire died down, I did too, going to bed. Appreciation for another wonderful day. 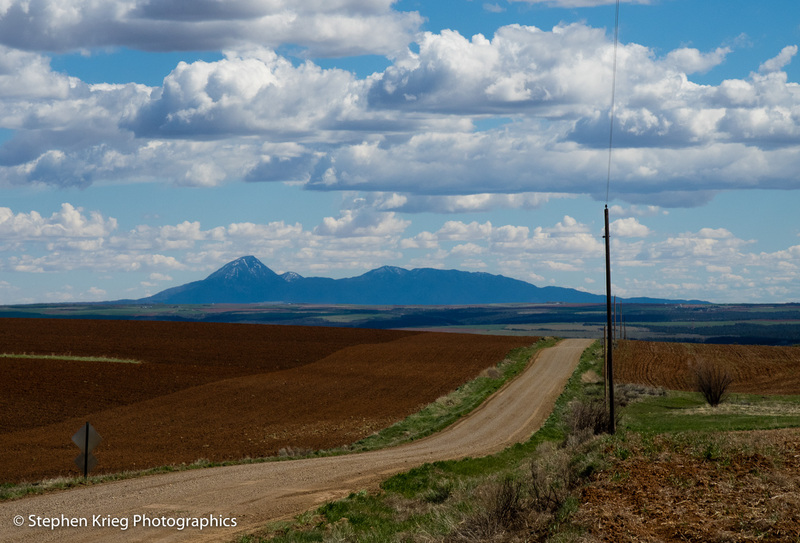 Photo location: Dolores County, Colorado. © 2015 Stephen J. Krieg. Dolores River Valley, San Miguel County, Colorado. April in southwest Colorado. Somewhere along the eastern edge of the high desert Colorado Plateau, below the Rocky Mountains. San Miguel County, in fact. The Dolores River, these days emasculated by the dam that impounds McPhee Reservoir way upstream, down here gets a massive transfusion from the lovely San Miguel River. This photo is a few miles downstream of their confluence, their muddy and clear waters still morphed into something in between. Good trout fishing waters, I’m told. Clear, crisp mountain air. Mighty layers of reddish sandstone opened by the ever restless waters downcutting through them. The bright green foliage of deciduous trees and shrubs along the waterway. Deep blue sky and bright cumulus clouds. Almost no one around. Photo location: San Miguel County, Colorado. Sleeping Ute Mountain, from Dolores, Colorado. On an excursion to Cortez and Dolores in southwest Colorado I had a couple days to spare (as people say, as if days with nowhere that you need to be are in your personal life savings account or something), so I decided to spend them going up into the San Juan Range. Why? Because I hadn’t been up there in several years — was too engrossed in living in wonderful northern Arizona — I guess — and because the first real snowstorm of the season had blown through, leaving in its wake perfect cloudless deep blue skies and the high peaks shining with brilliant snow. Sounded good to me. After all, I was in charge of me, and there was no one else along to consult. So up the Dolores River canyon on Colorado Highway 145. Winding and slowly climbing in elevation. Up toward the snowy high country. 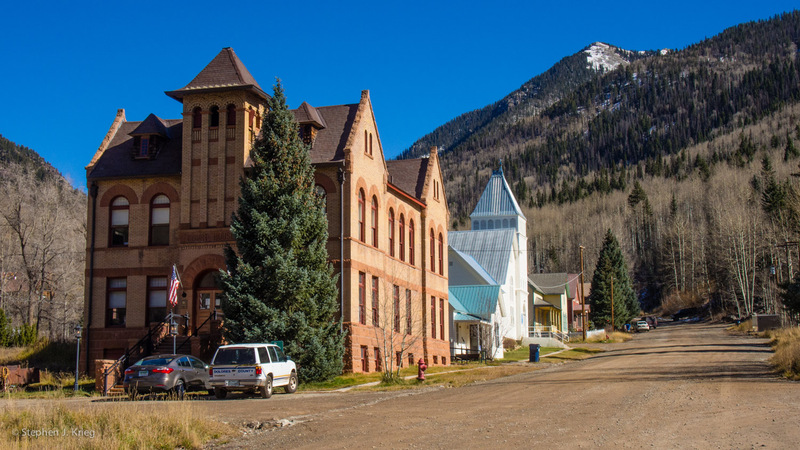 After a while I came to the tiny old mining town turned tourist stop of Rico, CO. 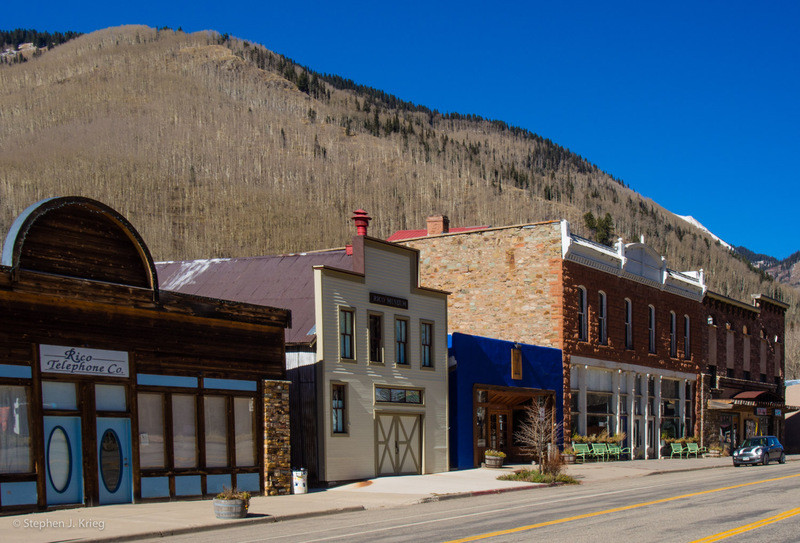 I love these old mountain towns and love seeing what is being done (or not) to revive small businesses and keep the place liveable. I pulled over to the side of the street to get a quick shot of downtown (the only part of town, too) Rico. Behind me the owner of a (the only?) hotel alertly spotted me and leaned out his front door calling: “Would you like to see my restored hotel?” A good entrepreneur: it was past the summer tourist season, almost nobody about on the street, and he’s trying to drum up business. I would have loved to, but I declined. I may have had two “free” days to play with, but my cell phone had messaged me and given me an important mission for the day. I would have to overnight some papers, and I was in the middle of nowhere. But Telluride was up ahead, surely they will have a FedEx facility. But I will be back to tour your hotel, Mr. owner. Thank you for the invitation. I like this town. Then I went up a few of the side streets. You can learn a lot about a town by getting off the main drag. In this case, I stumbled upon the Rico Town Hall, a fine looking historic sandstone building. How would you like to have your office in something like this? It would make going to work five days a week a lot nicer. But enough of that kind of daydreaming. Rico was giving tantalizing peeks at the snowy peaks above. So onward and upward, further north on Highway 145. I came to Lizard Head Pass, elevation 10,222 feet. No lizards up here, that’s for sure. It’s named after nearby Lizard Head Peak and Lizard Head Wilderness. Gorgeous. And I had finally left the upper Dolores River canyon, which had veered off to the southeast without saying goodbye. Canyons tend to do that. Not say goodbye, I mean. Snow Spur Creek, Dolores County, Colorado. Meanwhile, I was saying goodbye to Dolores County and hello to San Miguel County, which apparently allows some of their highway signs to be bulletin boards as well. Unless you get caught. If you did you could always serve your public service sentence by scraping off all the other stickers. Straighten the sign while you’re at it, the snowplows seem to have taken their toll on it. 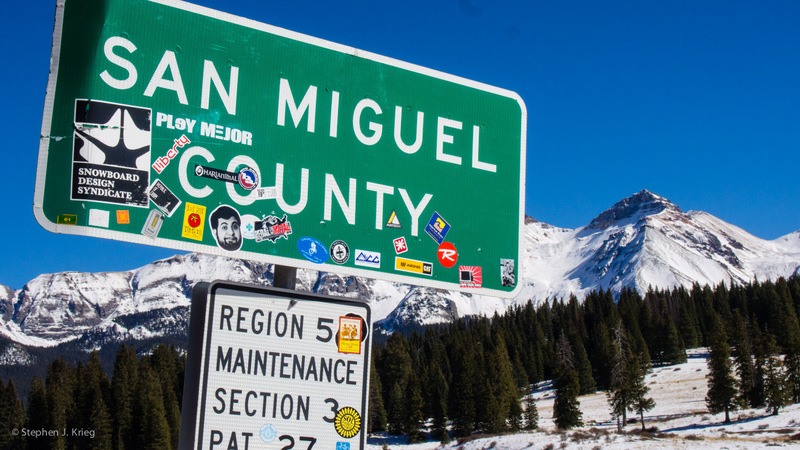 San Miguel County sign, Lizard Head Pass. Down the other side of the pass. Reveling in the brilliant early winter (late fall, really) light and mountain air. Dark green alpine forests and steep, steep mountainsides, crowned by peaks with their summits above timberline. So they can show off their snow. 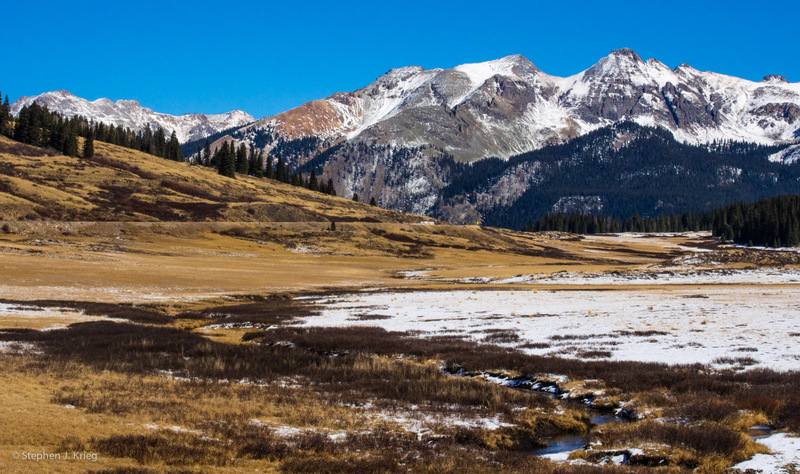 San Miguel Mountains, Vance Junction, CO. (Click on image for larger). Then into Telluride. I’ve only stopped there briefly before this, and would do so again today. It’s awesome but too crowded jet-set trendy expensive for a mountain man. I had no idea where the FedEx agent would be, so I stopped in at the official Visitor Center (15 minute parking only, don’t dawdle, now) and what do you know there was a FedEx sign in the window of another small business in the same building. Are things going right on this trip, or what? I would be a zillionaire today if I played the lottery, but I hear you have to buy a ticket. Mountain men don’t buy lottery tickets. We are one. 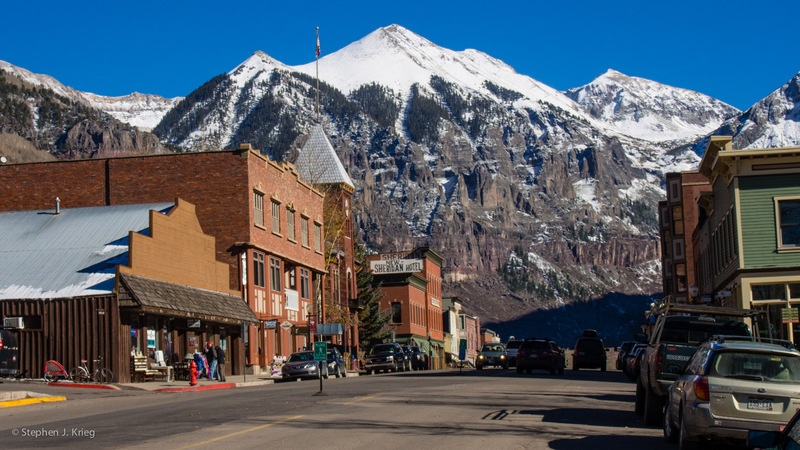 Went to the historic main street smack dab center of Telluride town to get me a few tourist photos before I escaped. Lots of construction going on, the real estate market sure is coming back. Historic old buildings and houses being rebuilt. Landscaping workers cleaning up yards and such. Glad everybody’s happy, I’m getting outta here. Back to the wilds. Now it was down the San Miguel River canyon. Exit Uncompahgre National Forest land, onto BLM (Bureau of Land Management) land. I was looking for a great campsite for the night, and I found one, right along the river bank, cement picnic table and all. I was the sole camper, and a happy one. Found enough Gambel oak wood on the ground for a nice fire. The sound of the rushing stream below was both soothing and invigorating. I had been living and camping away from that sound, from these mountains, for too long. And one more “spare” day to go. Upper San Miguel River, Colorado.